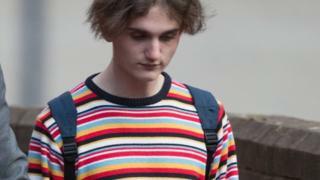 Image caption The email allegedly sent to Connor Scothern was said to be a "masterpiece of back-covering"
Birmingham Crown Court was told the pair received an email telling them to "throw away or burn any memorabilia" following police counter-terror raids. Barnaby Jameson QC, prosecuting, said it was a "masterpiece of back-covering". The message, headed "recent news", read: "I am sure you have all heard the news that four men have been arrested on the grounds that they are members of the terrorist organisation NA." Advising several recipients to distance themselves from NA, the message added: "Delete any affiliations you have to the group. "Throw away or burn any memorabilia you are holding on to. If anyone is caught breaking the NA proscription or advocating for NA or even holding any NA memorabilia they will be kicked from the group. "Stay safe and be smart. They are watching the far right's every step now and if even one of us slips up it will cost all of us. This is an all for one and one for all situation." Mr Jones and Mr Jack said they were "committed and unapologetic" members of NA but quit the organisation when it was banned, the court heard.